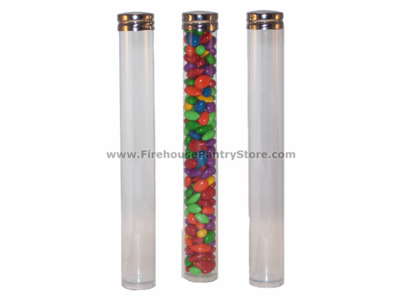 These clear, round, semi-flexible PET plastic tubes come with silver tone metal nickel plated screw caps. Holds 40 ml (approx. 2.7 Tbls.) 6" in length with a 3/4" diameter. A quantity of 1 = 12 tubes and 12 caps. There are many possible uses, including packaging for snacks, spices, aromatherapy bath salts, craft supplies, and more.